Make sure the Pimms and the lemonade are well chilled. 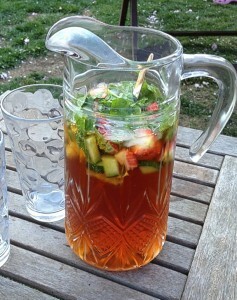 Put the Pimms in a large jug and add the crushed ice. Next, put in the strawberries, cucumber, melon and mint and stir. Fill to the top with lemonade and serve. Pour the lemonade in quite slowly or you will get a frothy head on it.